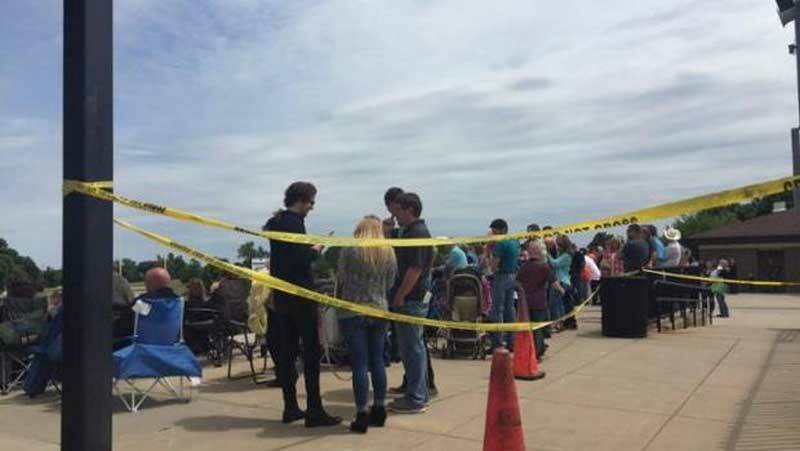 Two people were hurt in an accidental shooting at Augusta High School's graduation ceremony in southern Kansas. Augusta Police Chief Tyler Brewer said the shooting, just before 2pm on Sunday, was accidental and described it as a "knucklehead situation." 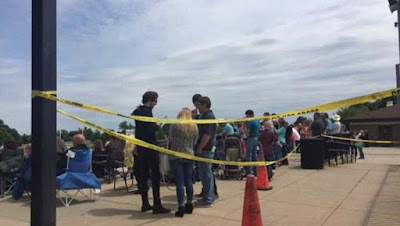 The shooting happened as people were filing into the football stadium for the graduation. 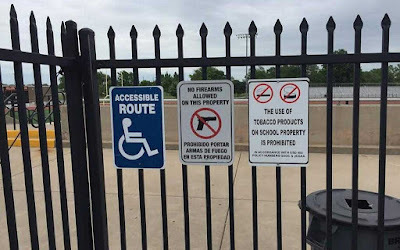 A man's concealed gun accidentally discharged when he was sitting at the Hillier Stadium, where the outdoor ceremony was held. Police said a bullet wounded the man's foot, then, the bullet or shrapnel ricocheted about 50 feet and hit a woman. Police said the gun owner has a permit, and was carrying a small, semi-automatic gun in his sock. The gun in his sock was uncomfortable and he was apparently adjusting it when it went off. The man was reported to have accidentally shot himself in the right foot and was able to drive himself to a hospital. The woman was taken to Wesley Medical Center in serious condition after suffering a wound to the calf. One witness, who knows the woman, said he heard the shot a little before the commencement ceremony began. He said he looked down at the woman's ankle or calf muscle and noticed the wound, which was "bleeding like crazy." He said he ran over to the concession stand and grabbed a lot of paper towels to try and stop the bleeding. The woman's family said she is going to be okay. Augusta police said the man whose gun discharged should not have had a gun on school grounds. Even outside, it is illegal to have a gun on school property. Brewer says he plans to present the case to prosecutors. Brewer says the Augusta High School commencement continued after the shooting, with most people unaware of what happened. What about the sacrosanct right to be a gun-toting nutter? How can they ban guns? This guy needs to climb three flights of stairs to reach stupid. If only more people there had guns this whole thing could have been prevented. I am embarrassed to be American, but at least I'm not from Texas. Or Florida. Yep, the more people with guns, the safer for everyone. Unless those people are idiots. At least he provided his own punchline by shooting himself in the foot (missing his brain by 3 feet).